Sunday’s edition of Last Week Tonight took a break from the political whirlwind, instead choosing to fix its critical, Google Glass-enhanced eye on the rise of cryptocurrencies. While the technological landscape is hard to correctly predict (see: Google Glass), both the inherent risk and reward of investment in the field holds true amidst the explosion of the cryptocurrency market. Bitcoin, the most well-known virtual currency, skyrocketed to values of over $20,000 in December of last year, but has lost half of that value in the months since, making it a prime example of the volatility of the unregulated market. These high fluctuations make what many see as a quick way to make large-scale money moves incredibly dangerous. 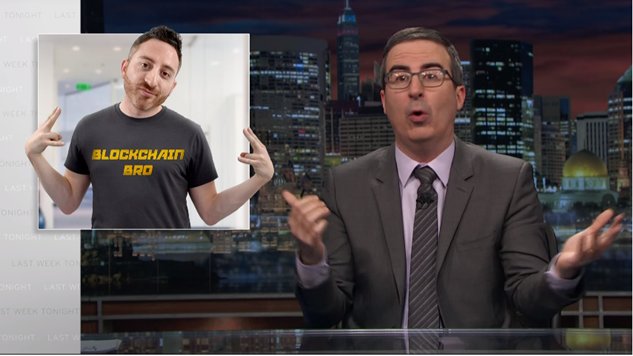 John Oliver examines the incredibly obtuse market in his latest main segment, breaking down the nature of the blockchain technology used to secure the market and the rising predatory culture within the cryptocurrency field. While Oliver is quick to note that not every cryptocurrency is out to dupe those who want to be on the cutting edge of neo-finance, he does ring the alarm in the case of some common industry practices that come off more than a bit skeevy. From new cryptocurrencies operating as investment tokens for businesses that don’t clearly outline their product or path, to delivery to the prevalence of “pump and dump” schemes easily inflating and bursting individual markets, to its markets growing in popularity simply through terminology and not substance, Oliver reveals major issues that can affect investors. The culture around cryptocurrency also has problematic characteristics. The ideal of holding onto your investment despite markets falling, known colloquially as “HODL,” breeds a culture of blind trust in the market and inspired a rap song that dethrones SNL’s “Tucci Gang” as the worst parody of Lil’ Pump’s “Gucci Gang.” The inclusion of scandal-ridden celebrity Brock Pierce, who is a member of the Bitcoin Foundation board of directors, as the public face of one cryptocurrency is also concerning. When a cryptocurrency made as a joke, such as Dogecoin, can garner copious investors, it’s easy to see why caution is crucial in an industry yet to gain mainstream credibility. Don’t let the exuberant BitConnect man sway you away from joining the #craefulgang. Check out Oliver’s story below.